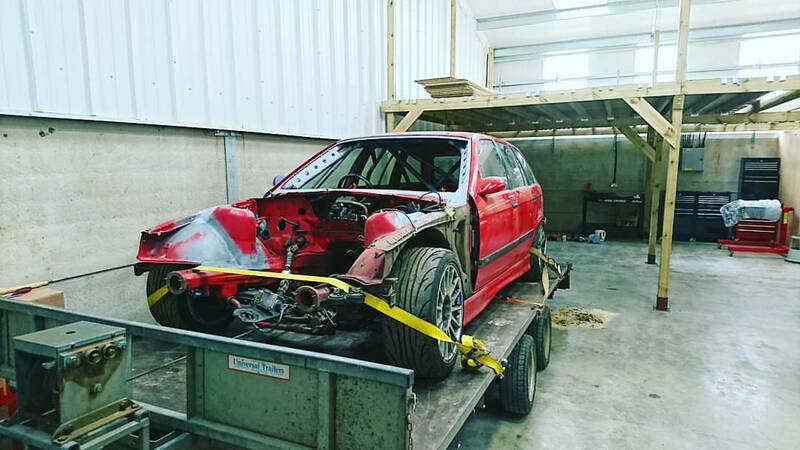 Hack Engineering MD Ben’s E36 has been a very long-term project, and has been through various guises. It began life as a 323i Sport Touring, which soon had a moderate chassis overhaul and was lowered about as far as it could go over E34 M5 Contours. However, trackdays began to appeal and soon enough things snowballed. The original M52B25 was tweaked for nearly 200bhp, an M3 LSD was fitted and weight started to be lost around the car. When the M52 gave up, an S54 was sourced and fitted along with the E46 M3 six-speed gearbox. It became one of, if not the first S54 E36 Touring in the world. Fast forward a few years and it really has become an extreme project. It currently sits as a bare shell which has a 10-point GDF Steelworks cage inside it. Various reinforcements are being welded into the shell before the underpinnings can be built back up. It’s been great to work on this with a number of selected partners from our esteemed suppliers list. Watch this space for a full spec list, and progress.